You don't have to wait for your favourite web sites to develop a mobile version that still has enough of the features that made the site worth visiting; you can get a real mobile browser instead. Skyfire can cope with normal web pages because it actually uses Mozilla's Gecko rendering engine on the Skyfire servers, not on your phone; that means it can run standard plug-ins like Flash and Silverlight that aren't available on phones or require a more powerful processor. Like the beta version, Skyfire zooms into the page intelligently when you double-tap (or click if it's not a touchscreen phone), so you get a whole column of text or zoom exactly to the video rather than having to scroll back and forth or zoom in and out. Unlike the beta, you only see 'guides' for what you're going to zoom in to if you're not using a touchscreen; this isn't quite as clear but there are new on-screen buttons for zooming in and out if you didn't get what you wanted. Zooming is faster and you can read the zoomed text straight away rather than waiting for a higher-resolution view to load from the server. And if you don't need to zoom in at all, you can click links, select buttons and type into fields without having to zoom in first. Another improvement from the beta is that you no longer need to wait for the start page to load before you type in a URL or search. The beta of Skyfire was fast at browsing pages but not always at connecting; both are consistently faster in the release version, with pages loading two to five times as fast as on an iPhone or 3G BlackBerry and five to ten time faster than Opera. It depends on local coverage and bandwidth but in tests on Windows Mobile, the TechRadar home page loaded in 17-25 seconds compared to 30-40 seconds on iPhone, nearly two minutes on Opera Mobile and 2 minutes 15 seconds on the BlackBerry Bold. 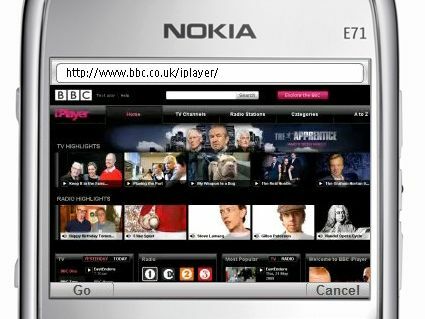 Symbian browsing is slightly slower, because most Symbian handsets have less powerful processors that take longer to display pages. The iPhone isn't the only good mobile browser any more; the release version of Skyfire combines desktop-quality mobile browsing at faster-than-usual speeds with finger-friendly navigation and social networking (you can see and send updates for Twitter and Facebook, read RSS and share links). We've been using alpha and beta version of Skyfire on Windows Mobile for several months and it transforms the browsing experience. You can do mobile banking on the regular web site, pick your seat when you check in for a flight, watch TV on BBC iPlayer (or Hulu for US users), work in Google Docs and use virtually any Web site the way it was intended. And good as the zooming is, it doesn't completely make up for the fact that you're viewing pages designed for a full-size monitor on a tiny screen and using a miniature keyboard to type. That's an impossible circle to square but Skyfire does the best job so far. Microsoft will finally give Skyfire some competition with Internet Explorer Mobile 6 this autumn and Fennec, the mobile Firefox, promises to up the ante too. But Skyfire will still have two advantages. Mobile browsers won't improve as fast as desktop browsers and the Web sites that rely on them; because it's based on the full Gecko rendering engine, Skyfire should continue to do a better job on complex pages and plug-ins. And because it does the hard work of rendering on the server and compresses the page it sends to your phone, it should continue to give one of the fastest mobile browsing experiences.